We’re happy to introduce adoptable young Monroe to our community. He is a one year old Guinea Pig named after Marilyn Monroe for the “beauty spot” he sports on his left cheek. Monroe is a well socialized piggy, and enjoys being held and stroked by gentle hands. He squeaks sweetly when his favorite animal care workers go by and when it is his favorite time of the day: veggie time! 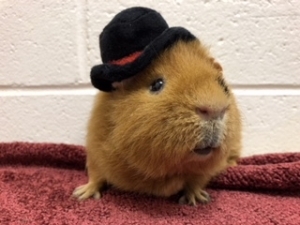 Our counselors are huge fans of guinea pigs, and love to speak to experienced and first time guinea pig adopters alike about creating the best quality of life for these peaceful, charming creatures. To learn more about Monroe and our other adoptable critters, please visit us online at CTHumane.org or in person at 455 Post Road East in Westport.